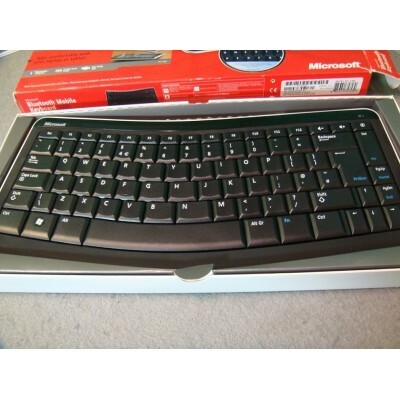 This is Microsoft Bluetooth keyboard which, although looked unused, we have removed from the box and tested to make sure that it is working - hence the description of 'used'. It has a UK QWERTY layout. It comes in its original box (which is a bit tatty) with manual and we have included new batteries. The one you see photographed here is the one you will receive. We provide you with a 30 day RTB warranty. We will post the item within 1 working day, for example if you buy on a Friday after 1pm, Saturday or Sunday, we will post on Monday (unless it is a Bank Holiday and then it will be a Tuesday). Buy on any other day and we aim to get the item out same day if purchased before 1pm, otherwise item will be sent next business day. If paying with Paypal the item must be delivered to the address on the Paypal account.